We saw this at the City Screen cinema in York yesterday with E4 Slackers Club tickets and it’s fair to say we weren’t disappointed. I’ve always been scared of zombie films – I can barely tolerate Shaun of the Dead without freaking out – but I managed. As expected, it’s not full of blood, guts and gore because it’s not advertised as that. 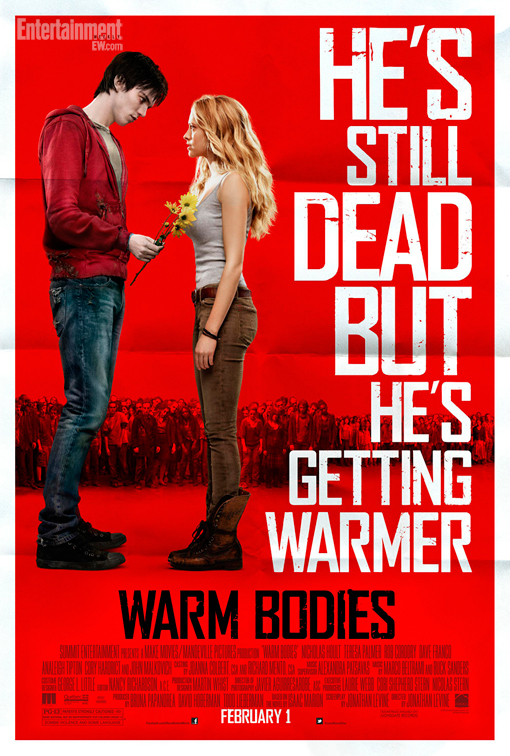 It’s, essentially, a zom-rom-com. It’s cute. Nicholas Hoult is adorable and one of the most good looking zombies I’ve had the pleasure of looking at. As well as being insanely cute, it’s also hilarious and there’s plenty of laugh out loud moments in it, a lot of them a result of R’s (Hoult) awkwardness with Julie (Teresa Palmer). This is what makes this zombie film a little more special than others; R isn’t like the others. Sure, he acts like what you’d expect from one at the beginning with the groaning, shuffling and people-eating but there’s something about his thought processes – given to us through a delightful and adorable self-narration – that makes him more human. It’s such a nice little love story because he clearly falls in love with her at first sight, then he tries to win her over after defeating the competition using a seemingly unorthodox method. But it’s not gooey and it isn’t annoying in the sense that there’s not a great deal of emotional turmoil and Julie isn’t deciding who she loves the most, not referring to any other fantasy love story in the slightest.